Karnala fort lies within the confines of Karnala bird sanctuary and the established routes to the fort start within the sanctuary. The sanctuary entry gate is on National Highway NH66, around 13 kilometres from Panvel town. Karnala bird sanctuary is home to over 140 different kinds of birds. Although the monsoons make a perfect time for exploring the sanctuary, it is not the best time for bird spotting. The winter months from November to January are the best time for bird watching. The sanctuary also boasts of a guesthouse which is a steal at Rs. 400 a night. You may choose to make a reservation or check its availability with the guard at the sanctuary gate. The guesthouse comprises of two bedrooms, a living and dining room surrounded by a verandah, and it is constructed in sagwan wood and exudes a nostalgic old world charm. Nevertheless this whiff of charm is offset by poor maintenance and lack of cleanliness. As with most government run institutions, it is a beautifully constructed building but equally poorly maintained. If you do plan to spend a night at the guesthouse we recommend that you ask for the toilet to be cleaned and bring your own bed linen. The sanctuary grounds also contain a nursery and a cafeteria that makes simple yet delicious Maharashtran cuisine. The cafeteria open at 9 am and stays open till about 5 pm. A few roadside eating places located just opposite the sanctuary gates and they offer food and budget beds for an overnight stay. The forest officials at the sanctuary take their "no plastic" agenda quite seriously. At the entrance you are required to deposit a fixed amount of money per plastic article. This amount is refunded when you prove that you are carrying out plastic that you have taken in. There are two trails from the sanctuary cafeteria that lead to Karnala fort. The 2.6 kilometre Karnala Fort trail is the longer but a more scenic trail amongst the two. The Karnala Fort Trail starts next to the sanctuary's first aid station and a signpost marks the starting point for the trail. From the first aid station the trail winds its way along the sanctuary forest. For the first kilometre the forest is thick and it does not present many view points. This first kilometre is steeper than the rest of the trail. The terrain is mud, that is overgrown with scrubs and roots. A few rocky intersperse these muddy sections but the rocky sections are few and far between. Despite the monsoon overgrowth the trail is a meter wide and it is well used. Therefore, navigation is not a problem if you stick to the trail. The trail is interspersed with tin roofed shelters and the third tin roof shelter marks the midway point in terms of effort. At this midway point the trail emerges from the jungle and takes a sharp right heading due south. This sharp turn is where the trail meets the ridge and Karnala fort lies on the south end of this ridge. The walk along the ridge is a gentle climb and the terrain is hard packed mud that makes walking a doddle. Since this is a north - south traverse, the views on both the east and the west are beautiful. These views are especially beautiful during the monsoon season when the sanctuary forest turns into a super saturated shade of green. To the right (west) we can see the Ransai reservoir whereas to the left (east) a few lone hills tower over Shiv Nagar and Akulwadi. The trail heads due south past a couple of tin roofed shelter and on to a small temple. Just before the temple the basalt pillar towers into view and so do the fort walls. From these walls, carved stone steps lead you up to the base of the Basalt Pillar. The stone steps leading to the base of the tower are steep and broken in places, but they are bolstered by a metal railing on the steep end. The metal railing is an eyesore and looks garish against the green and black tower, but it is a good insurance against accidental falls. A carved out water pond sits at the base of the basalt tower and this pond was meant to hold potable water for the fort inhabitants. However the pond has never been cleaned since and the water in the pond is not potable. The best preserved bastions lie east of the fort and are accessible via stone steps from the base of the basalt tower. These bastions may get windy during the monsoons, but they make excellent viewpoints and a great place to relax and dry off after the climb. Karnala fort bastion. The best viewpoint and the place to relax. The Nature trail is a shorter, steeper and direct path that joins the Fort Trail close to a tin roofed shelter on the ridge. The Nature trail starts next to the pond near the cafeteria. Just after the pond, a narrow jungle trail points straight ahead through the jungle to the fort. This narrow trail is rocky and some sections involve using the neighbouring vegetation to ascend. A couple of streams en route ensure that getting your shoes wet is a must during the monsoons. The Nature trail route cuts down the distance to the fort by about half, but it does not add to the view. If you are looking for a bit of a challenge then this route definitely recommended in the monsoons. However, we would not recommend this route with small children or for novice trekkers. Karnala Bird Sanctuary is 60 km from Mumbai, on the Mumbai-Goa Highway, NH-17 (NH-66). This is a 2-hour drive via Thane Creek and Panvel. Central Railway trains from Chhatrapati Shivaji Terminus Station stop at Panvel, 13 km from the sanctuary. From Panvel you can catch autorickshaws, taxis and buses. State Transport buses run from Mumbai Central to Karnala. From Panvel regular buses and autorickshaws (6 seaters) going towards Pen will drop you at Karnala. However their frequency reduces after 1800 hours. The fare is around Rs 10.00. If you're getting your car or two-wheeler, there is a car park which can take around 15-20 cars. To avoid problems, the earlier you come, the better. The place usually fills up by 1400 hours on weekends. Forest Rest House available to visitors inside the Sanctuary at Rs 400 / night. Budget hotels outside the sanctuary provide rooms at around Rs 500 / night. Monsoon is the best season for this trek. The vegetation is lush green and the water streams triple through the trekking route. The fort and its bastions can get very windy and wet in a thunderstorm. The trekking route is interspersed with rain shelters. Caution - While it is easy to dismiss this trek as a day walk, remember that you are in a nature reserve. Descend before it gets dark as there have been instances of animal attacks. 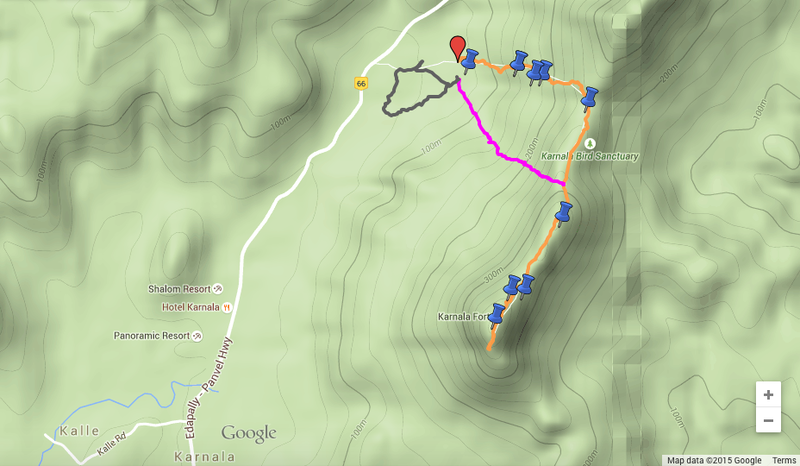 View / download Karnala Fort Trail GPS route from wikiloc. Click here. View / download Nature Trail GPS route from wikiloc. Click here. View / download all Karnala Bird Sanctuary GPS routes from Google Maps. Click here.